Nita Microtek has booked more than 350 Domains for its Clients. It is extremely important to have a unique and relevant Brand Name / Internet Address to your business on the Internet. Your Brand Name is represented by a Domain Name, which is a unique address that identifies your Organisation which is connected to the Internet. Reserve your own domain name today and have it ready for future use. Don't loose chance to get the domain name of your choice. 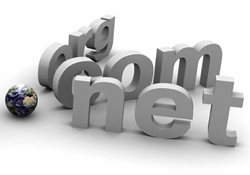 We will register your desired domain name, you will own it, and we can even point it to your existing Website.